Pick a mystery gift which might be Marks & Spencer hampers, Crabtree & Evelyn toiletries set, Kinokuniya vouchers, Yuzu meal vouchers etc! 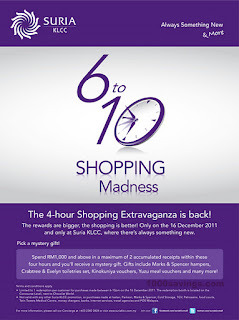 Spend RM1,000 and above in a maximum of 2 accumulated receipts within these four hours and you'll receive a mystery gift. Gifts include Marks & Spencer hampers, Crabtree & Evelyn toiletries set, Kinokuniya vouchers, Yuzu meal vouchers and many more! 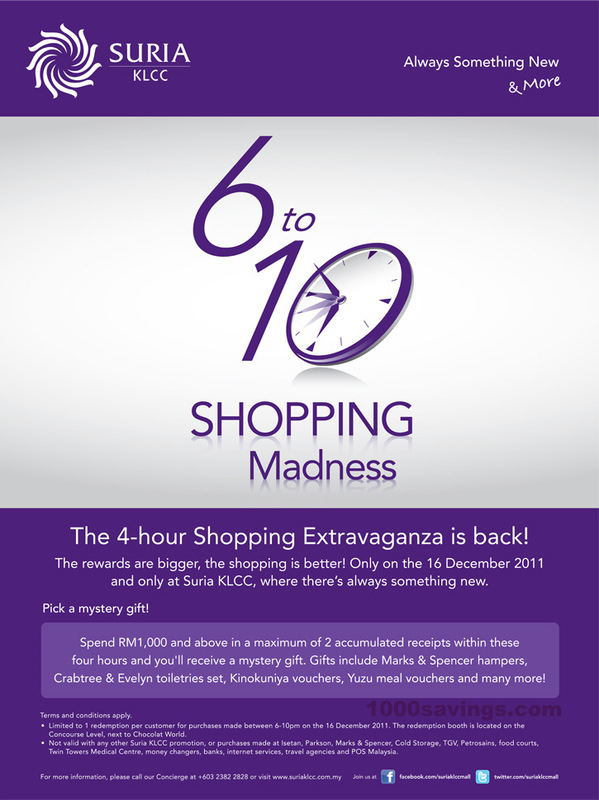 * Limited to 1 redemption per customer for purchases made between 6-10pm on the 16 December 2011. The redemption booth is located on the Concourse Level, next to Chocolat World. * Not valid with any other Suria KLCC promotion, or purchases made at Isetan, Parkson, Marks & Spencer, Cold Storage, TGV, Petrosains, food courts, Twin Towers Medical Centre, money changers, banks, internet services, travel agencies and POS Malaysia.